Get instant feedback from downrange with these highly visible VisiColor paper targets by Champion. The VisiColor black shooting surfaces bursts into various colors so that you can confirm your shots without making the long walk. 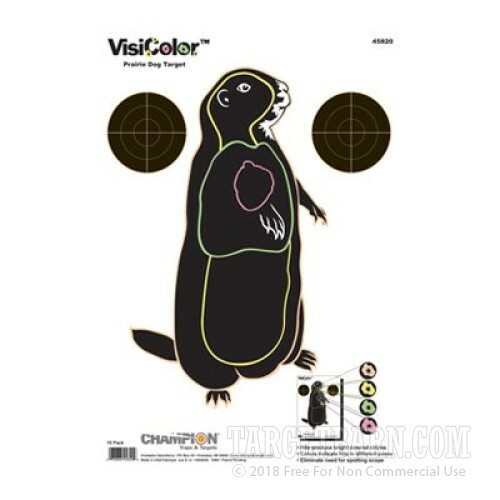 On this prairie dog target there are four different colors and the brighter pink represents the dead center of heart and lung shots. These targets measure 11 inches wide by 16 inches tall and are great for indoor and outdoor use. The prairie dog shooting surface is great for teaching new shooters to make precise and humane shots while hunting. These targets also feature two 6-inch diameter VisiColor Bullseyes for confirming zero or proving ammunition precision with a group.